The Chinese students from Qingdao University who visited NIIT University in India vividly recall watching the sunsets and listening to insect songs on campus as well as the experience of enduring India’s currency cancellation. 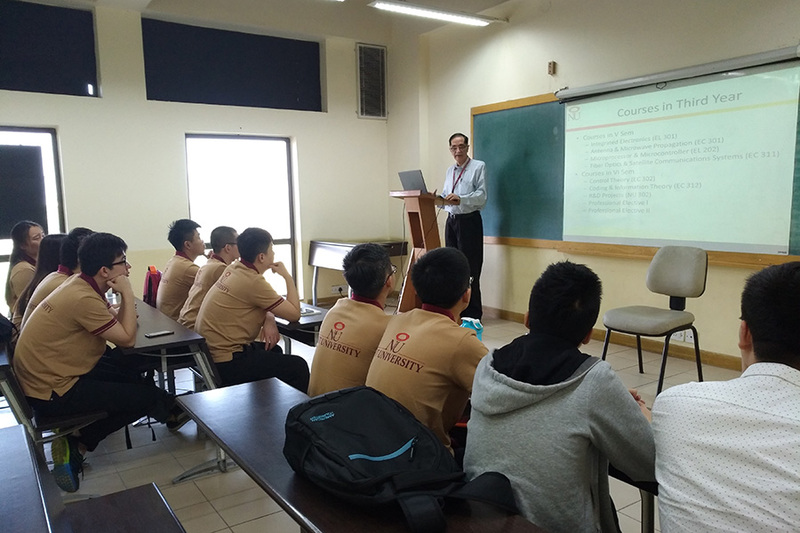 A lecturer with NIIT University introduces the curriculum for its IT major to the visiting students from Qingdao University. This June and July, about eight million college graduates in China bid farewell to campus life. Graduation season is consistently filled with sweat and tears as years of memories melt into the summer heat. 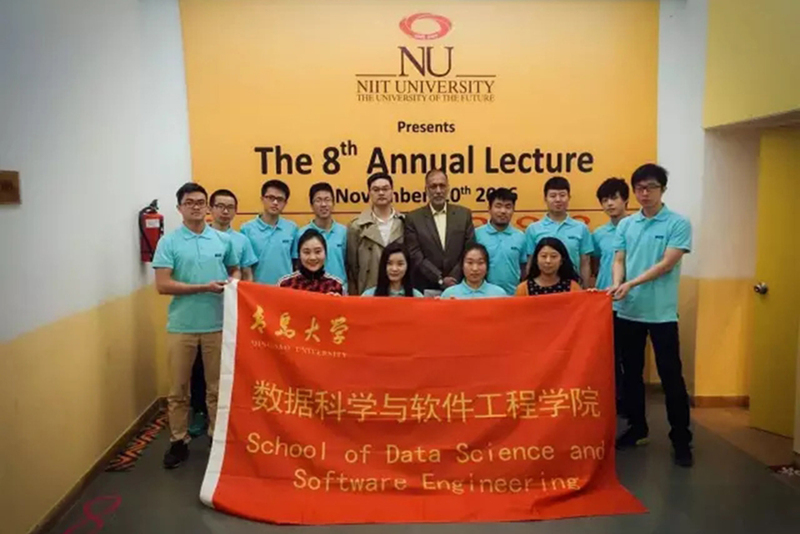 For Bi Fenglin, a software engineering graduate of Qingdao University in eastern China’s Shandong Province, his visit to India’s NIIT University (NU) was a particularly unforgettable chapter of the last four years. Back on November 4, 2016, Bi landed in New Delhi along with a dozen other representatives of Qingdao University after an eight-hour flight. They headed straight to Neemrana, a small town in the state of Rajasthan which is home to NU, for a month-long stay. 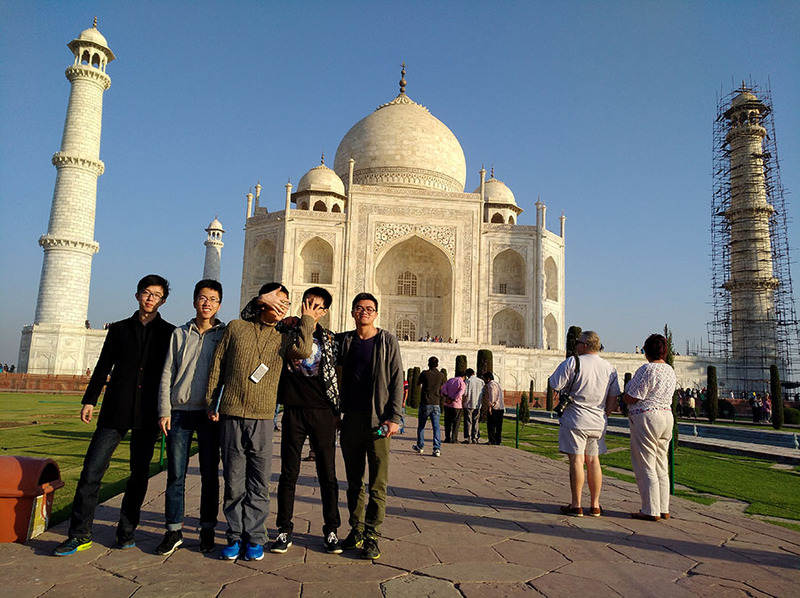 Students from Qingdao University visit the Taj Mahal while one tower is under renovation. The month was packed with well-designed courses and trips to NIIT Group’s headquarters in New Delhi and its key departments including technology innovation and educational materials innovation. The group also visited the Chinese Embassy in India as well as the Taj Mahal, Red Fort, and Delhi Gate. Bi’s memories are dominated by the geckos and squirrels roaming around campus, insects songs at sunset, and India’s stormy currency swap campaign. Qingdao was quite chilly in November, but in Neemrana short sleeves were still crucial. However, the town’s temperatures varied so widely that a jacket became necessary in early mornings and late evenings. Nestled in the Aravali range, NIIT University’s lawns blanket the hilly land. Pigeons and bees danced around the campus, and Bi discovered geckos and squirrels in the teaching buildings. The visiting teachers were lodged in small dorms in the building housing NU staff. The rooms were like those in Chinese motels, but with fewer amenities. Two students in the group shared each room. Teacher Song Yuanyuan noted the limited access to hot water, but she took it pleasantly because “water is such a scarce resource in India.” Without local SIM cards for their phones, the wireless network in the dorm helped the students stay in contact with their friends and family back home. NU’s dining facilities seemed busier than their Chinese counterparts. Following breakfast at 6 o’clock in the morning, meals are served every three hours including morning tea, lunch, afternoon tea and supper at 9 to 10 o’clock in the evening. The bustling eateries seemed to arouse curiosity in the newcomers, and they were excited to do as Indians do and eat with bare hands. 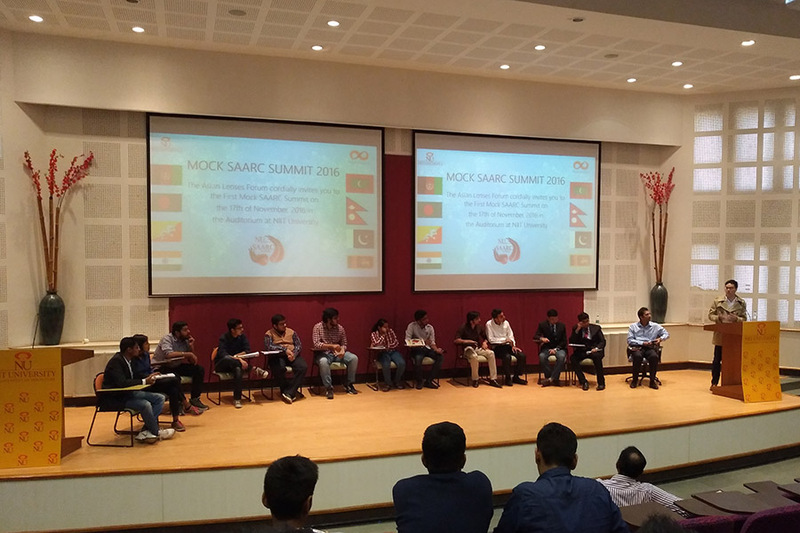 Li Jingwei, a lecturer at NIIT China’s headquarters in Shanghai, gives a speech on the Belt and Road Initiative at the model summit of the South Asian Association for Regional Cooperation held at NIIT University. Differences in diet, however, are not as easy to overcome. Many locals in Rajasthan are vegetarian, and most NU students opt for the vegetarian cafeteria. Only modest portions of meat are served in the other dining hall. After about a week, many in the visiting group began to long for something more than vegetables and curry and their hunger for meat grew. Luckily, some small restaurants near the university were happy to serve them roasted chicken. Thanks to the comprehensive courses of NU, the visiting group learned advanced ideas and cutting-edge technologies from IT professionals and exchanged experience on software development with local students. Moreover, the month-long curriculum included specific subjects such as data mining, biological information, business analytics and even Sanskrit. The third week of the trip coincided with NU’s activities week. Welcoming a break from lectures, students enthusiastically dove into artistic and sporting competitions. Teachers and students from Qingdao University were invited to attend plays, fashion shows and dance performance. They also played a friendly basketball game against NU students. The day before returning to China, the group was led to an open-air rooftop theater on a teaching building for a special class. There, they meditated while enjoying the sunset. Organizers had hoped to catch the sunrise the following morning, but cancelled due to heavy smog. As a backup plan, a sports teacher escorted them to the mountains for a hike, a popular activity for NU students. 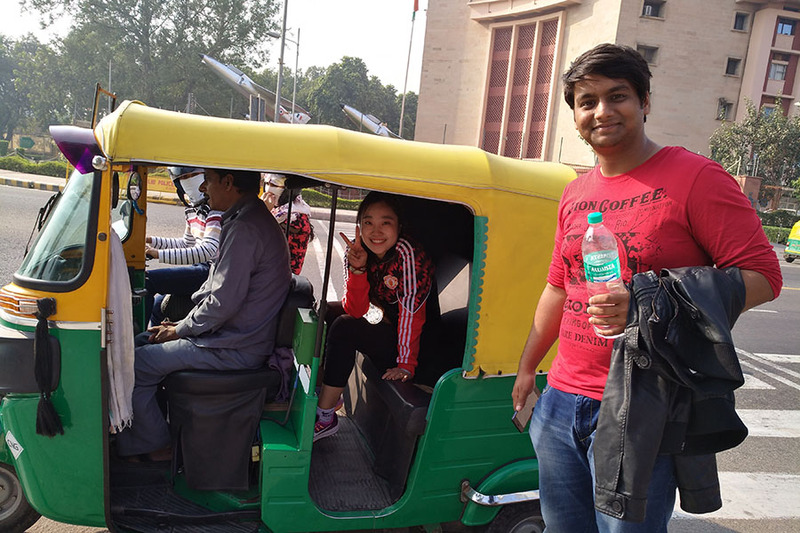 An NU student helps a teacher from Qingdao University experience tuk-tuks in Delhi. The fourth day after the visiting group arrived in India, they witnessed Prime Minister Narendra Modi’s announcement that all 500 and 1,000-rupee banknotes would be voided and replaced by new bills worth 500 and 2,000 rupees. Chinese teachers and students were carrying considerable cash at the time. “Business owners refused these banknotes when we started shopping,” Song said. Affected by the nationwide demonetization, the group had to join the locals in long queues at local banks to exchange the bills. They started from local banks near the NU. The visiting group of Qingdao University takes a group photo with Rajendra S. Pawar, co-founder of the NIIT Group. Banks gave women priority service, so the female visitors were first to accomplish the currency exchange, but some of the men had a much tougher time when banks ran out of the new notes before they reached the counter. Bi recalled that local banks would come to enterprises to exchange money for employees, and the visiting group enjoyed this service alongside NIIT’s employees a couple times, but it was still far from enough, so the company exchanged the rest of its old bills itself.